The Best Fried Chicken in the World, and What to Drink with it. "Like a vintage Ferrari- you just don't want anyone else to drive it." Associazione Italiana Sommelier... AKA "AIS in LA"
Jura is a phantom for me. Quiet, mysterious, and elusive. This is one of France’s smallest and lesser-known wine regions, situated east of Burgundy near the Swiss border. Jura’s craggy, gently rolling terroir holds the secrets of diverse and rambling microclimates- from limestone to marly soils, and from dry summers to cold winters. From the few wines I have tasted so far, I believe Jura must be a woman. Beautiful and multi-faceted, equally angelic, graceful, and yet completely frustrating. I am totally captivated. 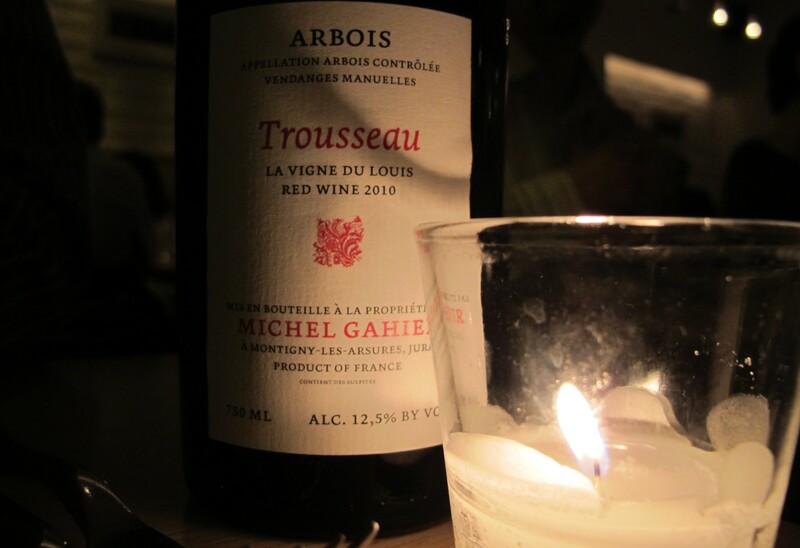 I tasted this gorgeous Jura wine from Michel Gahier on a dark, steamy night in San Francisco. We were ensconced in one of the city’s most intriguing new restaurants, Commonwealth, when I had my first sip of this wine, made from Jura’s typical red grape, Trousseau. First, the wine is bright, full of a lean acidity- long, elegant limbs confidently striding over ancient cobblestones, silk skirts floating over strong calves and ankles. Then, there is a hint of black fruit- the aftertaste of a sun-ripened blackberry, and then nothing but dark, damp forest floor, mushrooms and tree bark. This wine is a stunning enigma. I had never tasted anything like it. It is a first kiss, a long, hot look across a crowded room, a familiar embrace. Just a Little Good, Clean, All-American Fun. Hi Joanie – came across this because I have a Google alert for anything written on Jura wines! And I hope you enjoy discovering more wines form the Jura soon! Thank you so much for this reply! I am always looking for new resources- I am sure your site will be right at the top of my list! should I put Commonwealth on my list of first bites when we get to SF? Without a doubt some of he best food I’ve had in the city. Could have been the wine, too. And certainly the company. I have a ton of recommendations… ON and OFF the record! PS the photo of the label is moody, atmospheric and – yes – romantic – perfect setting for your seduction! Thanks so much! I am seriously excited about these wines… let me know what you find when you get to France!